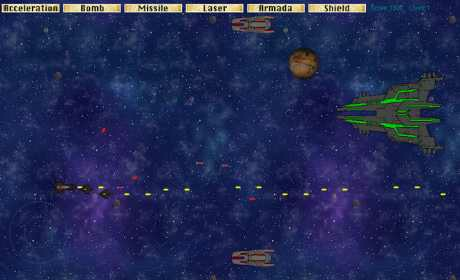 Orion The Alien wars is an innovative throwback to side-scrolling SHMUP titles in the arcade era. Foreign galaxies are in conflict between Alien invaders and rebel fighter pilots. Your ship may be a junker, but with stolen alien power cells and skillful maneuvers, you will upgrade your star-fighter into a terrifying ace flyer! Collect power cells, predict enemy formations, and rock to our lovingly-crafted techno soundtrack in both CLASSIC and ENDLESS modes! Team Orion went for an immersive game design missing in the modern era of indie games. Gameplay is about tactical prediction and staying focused. 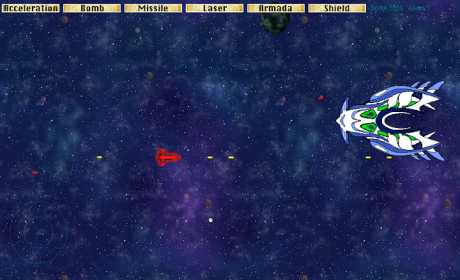 Orion The Alien Wars requires patience, memory, and skill in equal measure, favoring a well balanced and cool-headed player. 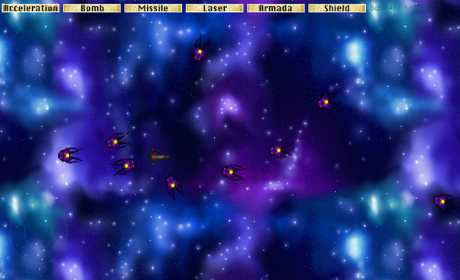 Endless mode, however, throws the gauntlet down and challenges the player to a high-stakes onslaught of homing droids! The mission? SURVIVE! Orion is our passion project, and we’ve planned to develop additional content to the game if it is supported and well-received by our fans. – Additional galaxies will be added to Classic mode. As the game currently stands there are only 3 galaxies, but we want to put multiple additional words to make Orion The Alien Wars a massive, artistically powerful game. Each new galaxy will experience a major aesthetic redesign compared to previous worlds to reward dedicated and skilled players with beautiful new content. Elegant particles, shifting galaxies, hyper-drive, expressive new planets and enemies, and a rehab to the current graphic design will accompany each new “galaxy” or world. We want the game to breathe life through vivid light displays and spacial colors to make a stunning set of additions to the game. – A diverse cast of new aliens, environments, and Kaiju monsters will challenge players in new ways to make the additional world mechanically unique. Each new world will be given a theme that represents these new challenge and difficult-to-master enemies. – In addition to new worlds, the current galaxies will be touched up and improved upon in a similar graceful style. – Achievements and Game Center functionality! – Classic and Endless mode will have a Leaderboard so players can compare their score to their friends and the best fighter pilots in the galaxy! – Skill-locked (progress related) achievements which reward a player with new fighter pilots with unique abilities and talents to offer a wider range of tactical styles. When unlocked, the new ships are: Junkyard Bomber, Academy Ace, and Rebel Alien Fighter! – Weekly missions and special tournaments! FUTURE UPDATES could include other designs, but these are our primary concerns. Updates will NOT be purchased via in-app purchases or the app store! All updates will be available to all players at no additional cost. There are NO in-app purchases for this title. There are NO notifications, popups, or advertisements of any form. Content updates for Orion The Alien War will come at NO additional cost. The game is under 50mb and is downloadable without WIFI! Reviews are welcome! Please let me know what you think of our game and how we could improve the game for our fans! Available on the new Pixel 3!